Like old Seth Richard, “Mooch” Richardson is one of the countless blues musicians whose life and times are shrouded in obscurity. He showed up for two sessions while the Okeh company was in Memphis, producing a series of outstanding country blues recordings, then disappeared back into obscurity once they were complete. Perhaps the only really concrete fact known about “Mooch” is that he was really James Richardson. It has been supposed based upon his “Helena Blues”, that he hailed from Helena, Arkansas. 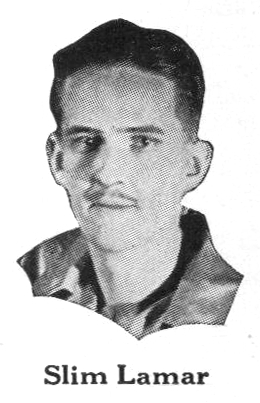 Historian Paul Oliver, in his Barrelhouse Blues: Location Recording and the Early Traditions of the Blues, suggested that Richardson was a pianist, based apparently upon his two-part recording of “‘Mooch’ Richardson’s Low Down Barrel House Blues”, and implying that Richardson played piano on those recordings (though he in fact did not). 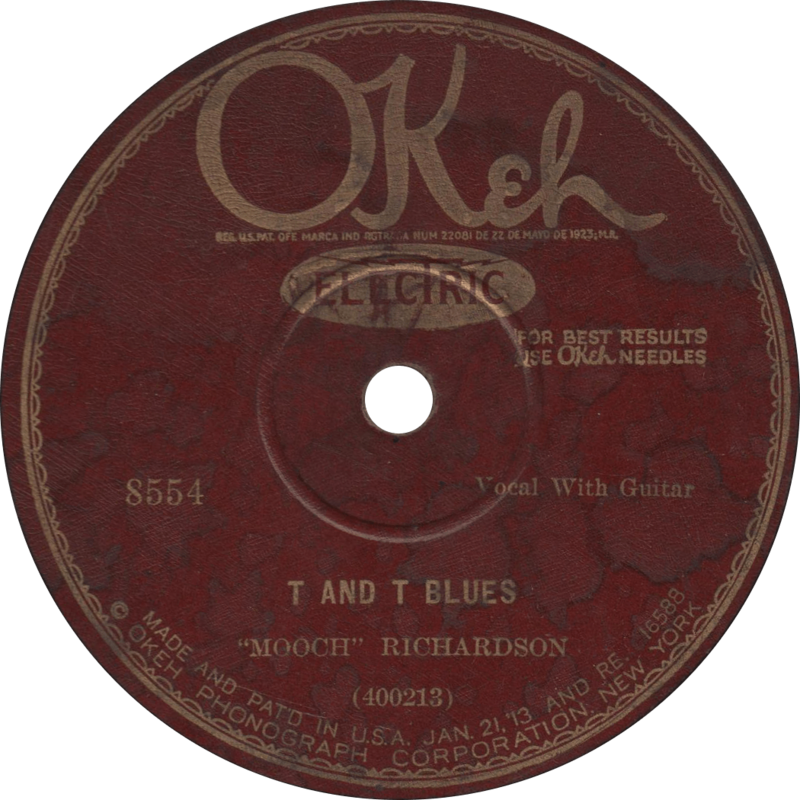 In February of 1928, Richardson appeared at two consecutive sessions in Memphis for Okeh, resulting in a total of nine recordings, six of which were released. He was backed by Lonnie Johnson either on the latter session or both, accounts differ. Whether or not Richardson was a resident of Memphis is another unknown. Those two record dates serve as the only hard evidence of “Mooch” Richardson, whatever became of him afterward is anyone’s guess (unless they’ve got access to better information than me). Okeh 8554 was recorded on February 13, 1928 in Memphis, Tennessee. There is question as to whether the guitar accompaniment is played by Richardson himself or by Lonnie Johnson; some sources state that Richardson accompanied himself on his first record date (which produced these two), and Johnson on his second, while others indicate that all of his recordings feature Johnson. To my ear, while the guitar playing sounds a bit more “standard country blues” than Johnson’s usual style of playing—which tended to be heavy on bent notes and elaborate melodic single-string runs—it at the same time could indeed quite plausibly be him; certainly Johnson was a skilled enough musician to play in such a style. The DAHR lists Lonnie Johnson on the first side and Richardson on the second, but both sound to be the same player, and if anything the “B” side sounds more like Johnson than the first. The more I listen to it, the more I think it is Johnson. It’s beautiful playing one way or the other. Contributors to the 78 Quarterly suggested “twenty-five or more” extant copies, with this copy being one of the ones reported (at which time it was in the collection of George Paulus). First up is the excellent “T and T Blues”, a mostly, if not entirely floating verse song drawing its name from the line “well it’s ‘T’ for Texas, lawd, I got a ‘T’ for Tennessee,” also heard in “Jim Jackson’s Kansas City Blues”, and famously in Jimmie Rodgers’ “Blue Yodel”, as well as others, including Willie Brown’s “Future Blues”. T and T Blues, recorded February 13, 1928 by “Mooch” Richardson. Another floating verse song, Richardson next sings “‘Mooch’ Richardson’s Low Down Barrel House Blues Part 1”. You gotta buy another record if you want to hear part two. 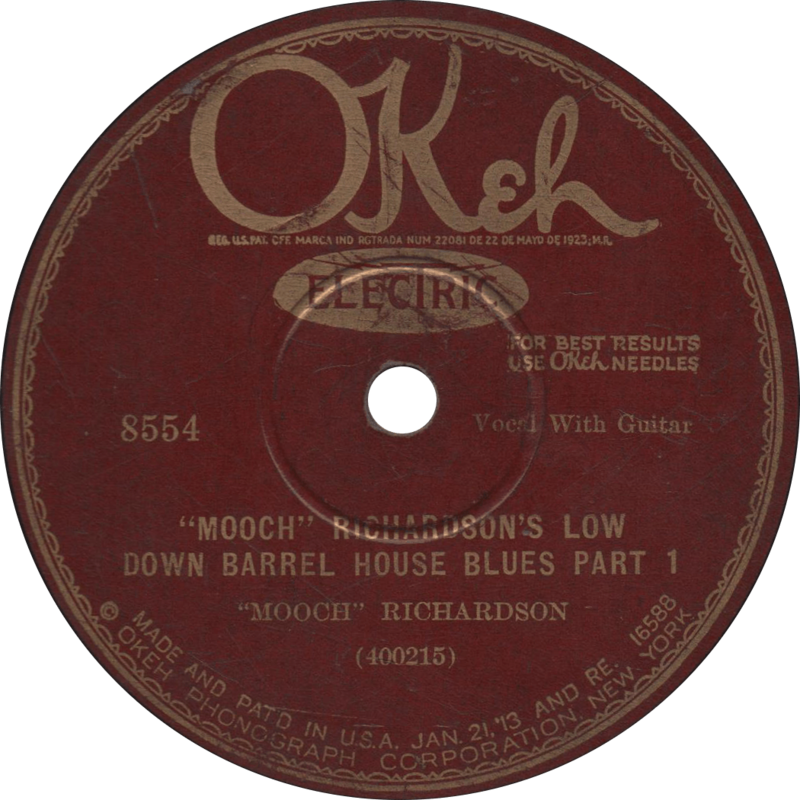 “Mooch” Richardson’s Low Down Barrel House Blues Part 1, recorded February 13, 1928 by “Mooch” Richardson. This occasion’s serenade is provided by the obscure but outstanding string duo of Nap Hayes and Matthew Prater, who play here a couple of snappy rag numbers on mandolin and guitar. Napoleon “Nap” Hayes and Matthew Prater were a pair of black musicians hailing from Vicksburg, in the heart of the Mississippi Delta. Hayes was likely born in 1885 in West Corinth, Mississippi, and Prater in New Albany in either 1886 or on June 30, 1889. With Hayes on guitar and Prater on mandolin, the two played raggy music in a style not too disparate from that of the Dallas String Band. In February of 1928, they traveled to Memphis, Tennessee to record a total of eight sides for Okeh Records, out of which all but two were issued. Half of those eight featured vocals and violin by Lonnie Johnson (though some sources, including Discography of Okeh Records, cite a different Johnson—T.C. Johnson—who recorded at the same field trip as part of the minstrel-esque trio Johnson-Nelson-Porkchop). Out of those three discs, only one was released in the 8000 “race” series, while the other two were in the 45000 “hillbilly” series. Each record was credited differently, one under their own names as Nap Hayes and Matthew Prater, another as “The Blue Boys”, and one with Johnson as “The Johnson Boys”. Of note, those sides included a piece titled “Easy Winner”, which, despite taking the name of another of his rags, was in fact a take on Scott Joplin’s “The Entertainer”. That session accounted for the entirety of Hayes and Prater’s recorded legacy, and their later lives are as yet undocumented. Okeh 45231 was recorded February 15, 1928 in Memphis, Tennessee by Nap Hayes and Matthew Prater. Hayes plays guitar, while Prater takes the raggy mandolin. I picked this record up in a junk shop, and it’s not in the most wonderful condition, but it plays quite well in spite of it. Not bad for a record that made the 78 Quarterly’s list of “The Rarest 78s”! The duo first play a peppy rendition of Scott Joplin’s 1903 rag “Something Doing”, here styled as “Somethin’ Doin'”. 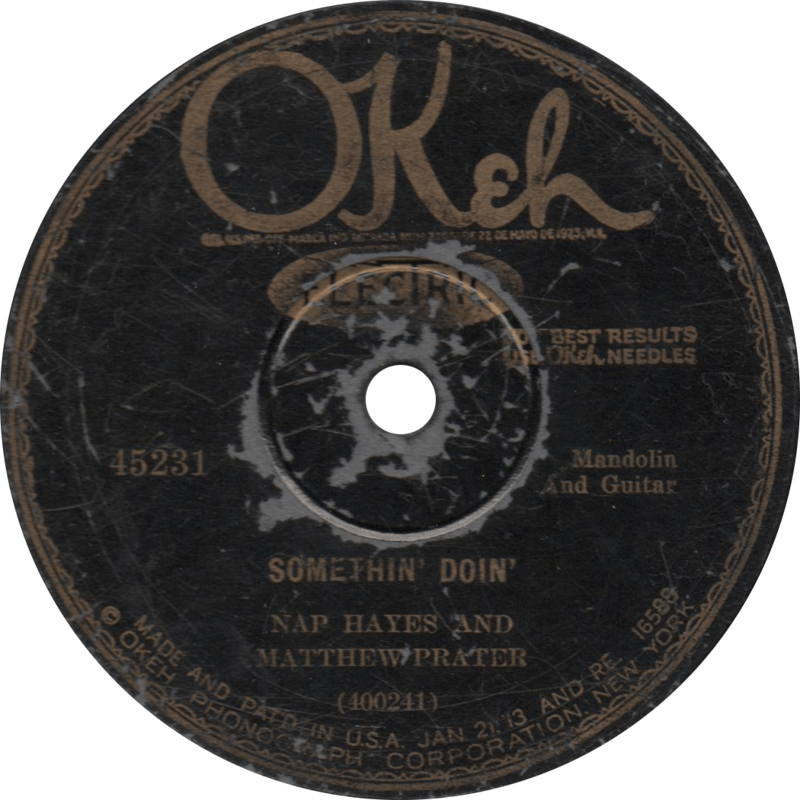 Somethin’ Doin’, recorded February 15, 1928 by Nap Hayes and Matthew Prater. As an answer to the first tune, on the flip they play the folk rag “Nothin’ Doin'”, a little bluer—and a little cleaner playing—than the previous side. I’m hearing a bit of Lemon Jefferson’s “Black Snake Moan” interpolated in this tune (“oh-oh, honey what’s the matter now”). 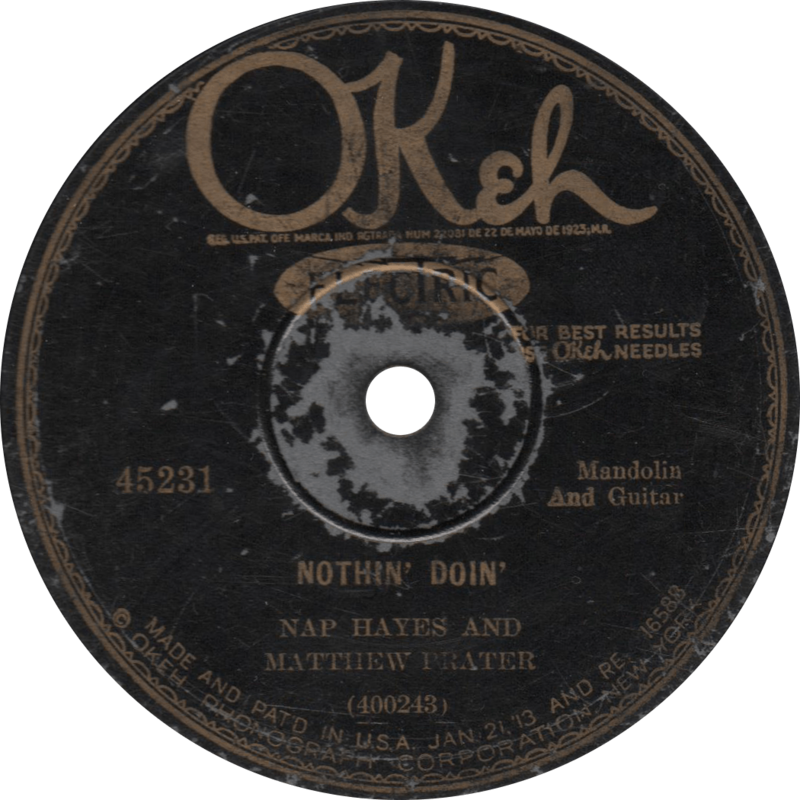 Nothin’ Doin, recorded February 28, 1928 by Nap Hayes and Matthew Prater. On of the great blues songsters of yesteryear was Jim Jackson. With a strong voice and a wide repertoire ranging from blues to popular songs to hokum, he one of the most prominent blues figures of his day. Jim Jackson was born on a farm in Hernando, Mississippi, twenty miles south of Memphis, most likely in June of 1876, though 1884 and 1890 have also been ventured as possible years. Sometime around 1905, Jackson began playing, singing, and dancing in medicine shows around the South. He was later a member of the famed Rabbit Foot Minstrels, and ran the Red Rose Minstrels himself. By the 1910s, Jackson worked primarily on Memphis, Tenessee, like contemporary Frank Stokes. His success on Beale Street was enough that he was reportedly residing in the luxurious Peabody Hotel by 1919. In 1927, store owner and talent broker H.C. Speir secured a contract for Jackson with Vocalion records. He made his recording debut on October 10, 1927, recording the first two parts of his “Kansas City Blues” series, which were issued as his first record. In addition to recording for Vocalion, Jackson also worked as a talent scout for the company, notably “discovering” boogie woogie piano man Speckled Red (Rufus Perryman). As one of Vocalions most popular race artists, the company released a “descriptive novelty” record titled “Jim Jackson’s Jamboree” featuring Tampa Red and Georgia Tom and Speckled Red, and “hosted” by Jackson. Jackson continued to record for Vocalion until 1930, and held several sessions for Victor in 1928. He supposedly played a bit part in King Vidor’s 1929 film Hallelujah, though it’s unknown what role he played, and indeed if he appeared in the film at all. Jackson’s last session was held in February of 1930, after which he returned to his home in Mississippi, where he continued to perform. Jim Jackson died on December 18, 1933. Vocalion 1144 was recorded in Chicago on October 10, 1927. Jackson’s “Kansas City Blues” songs were among the most successful and influential blues records of their time, inspiring numerous covers by contemporaries like William Harris and Charley Patton, and latter day artists like Janis Joplin. Some have cited it as one of the first rock ‘n’ roll records. First, Jackson sings the first of his four part series, “Jim Jackson’s Kansas City Blues–Part 1″. 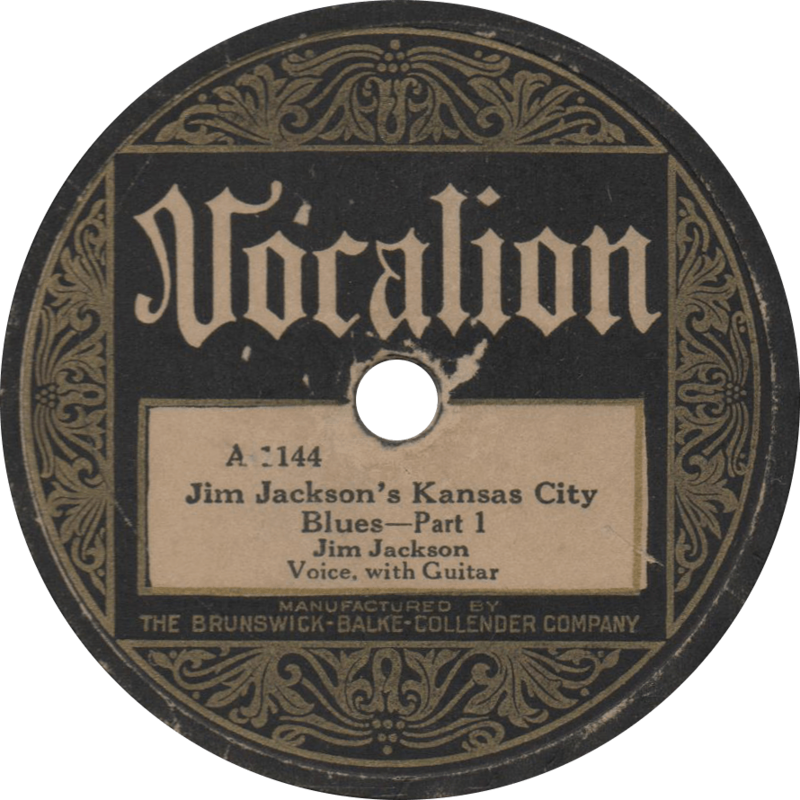 Jim Jackson’s Kansas City Blues–Part 1, recorded October 10, 1927 by Jim Jackson. He concludes the disc with “Jim Jackson’s Kansas City Blues–Part 2″. This is the second take of this side (“34” in the runoff), which may be more scarce than the more commonly heard first take. 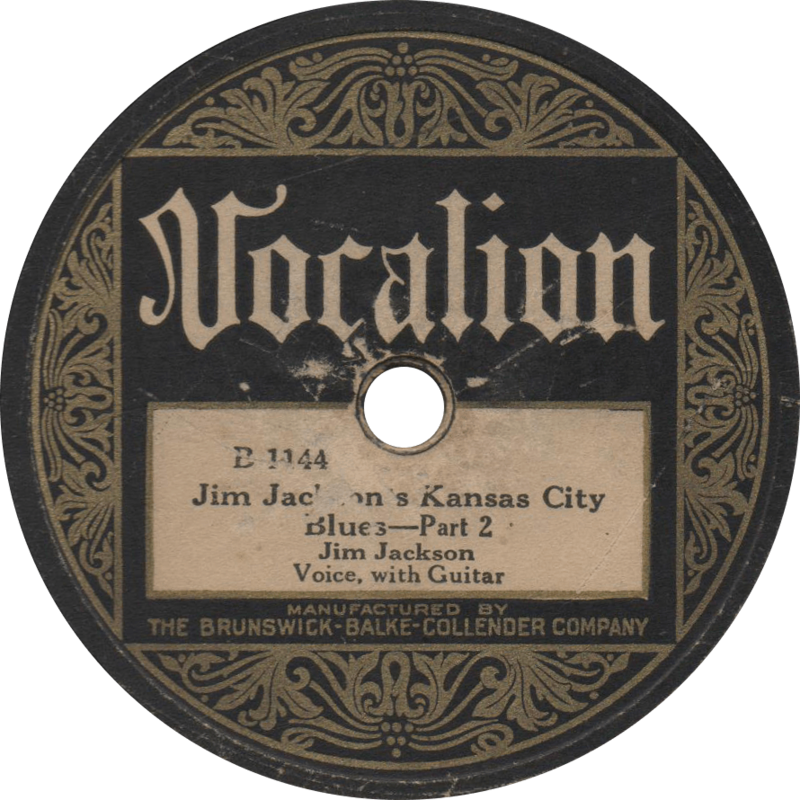 Jim Jackson’s Kansas City Blues–Part 2, recorded October 10, 1927 by Jim Jackson. On this day, February 5, we remember Will Shade, leader of the Memphis Jug Band, on the 118th anniversary of his birth on that day in 1898. Unfortunately, this disc by his illustrious Memphis Jug Band has seen a lot of action in its eighty-nine years of existence, and is in pretty poor condition, but, as is the case with many jug band records, it’s quite uncommon, and this is the best copy I was able to procure. “Audible but muffled” is the description given to the record by its previous owner, and the music sort of fades between “almost decent” and “downright lousy”. Oh well. Nonetheless, here it is. 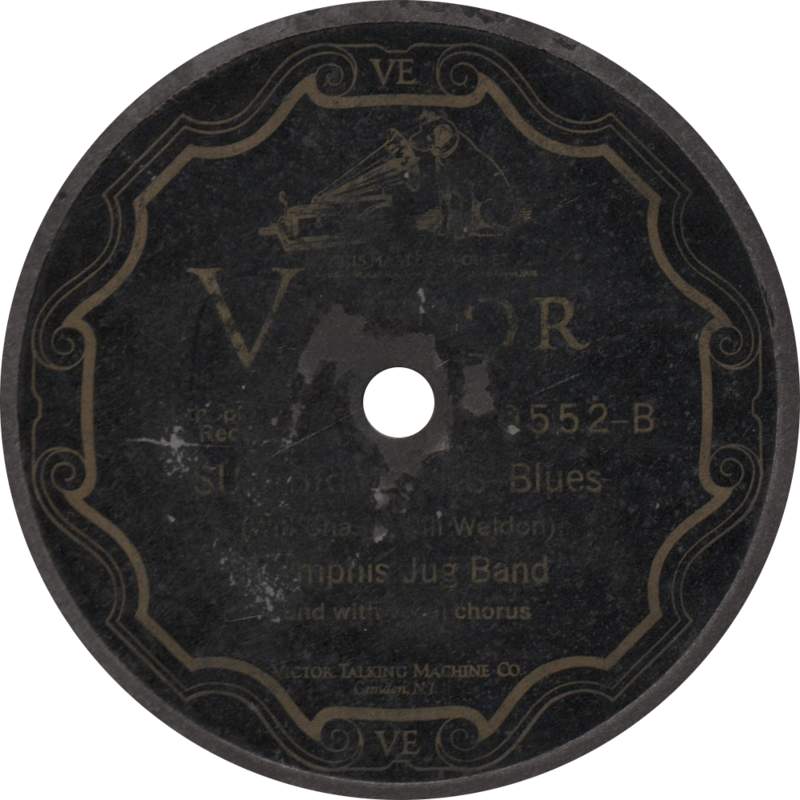 Victor 20552 was recorded February 24, 1927 at the McCall Building in Memphis, Tennessee, the first two sides from the Memphis Jug Band’s first recording session, and their first issued record. The band includes Will Shade on guitar and harmonica, Will Weldon on guitar, Charlie Polk on jug, and Ben Ramey on kazoo. “Stingy Woman” may or may not play a little cleaner than the flip side, which unfortunately isn’t saying a whole lot, and was recorded second in the session. Apparently the original owner wasn’t a fan of Will Weldon, going by their defacement of the label. 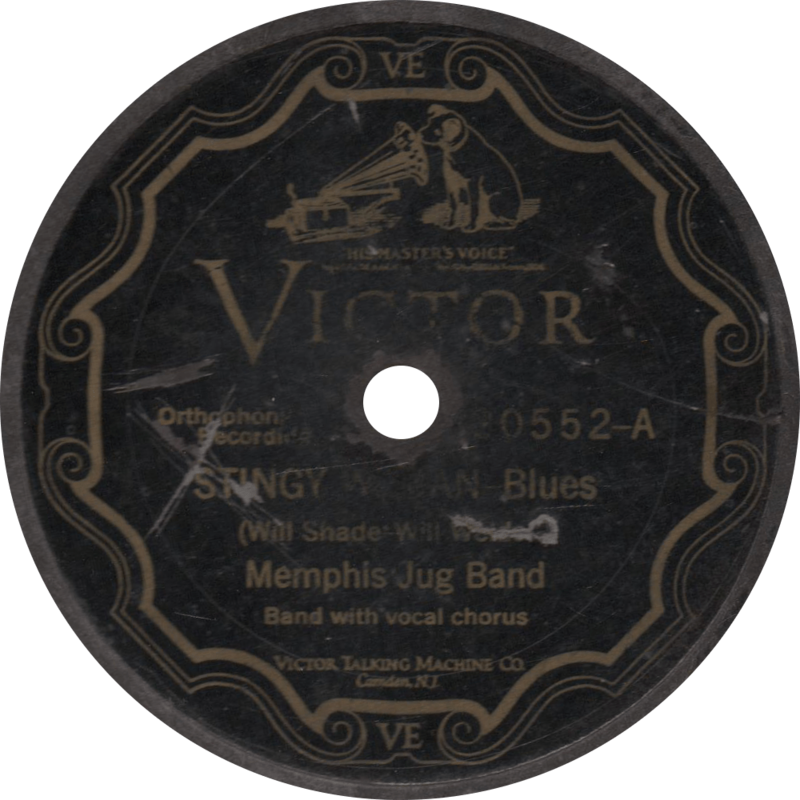 Stingy Woman, recorded February 24, 1927 by the Memphis Jug Band. “Sun Brimmers” takes its name from Will Shade’s nickname, Son Brimmer, and perhaps was intended to be titled “Son Brimmer’s Blues”. 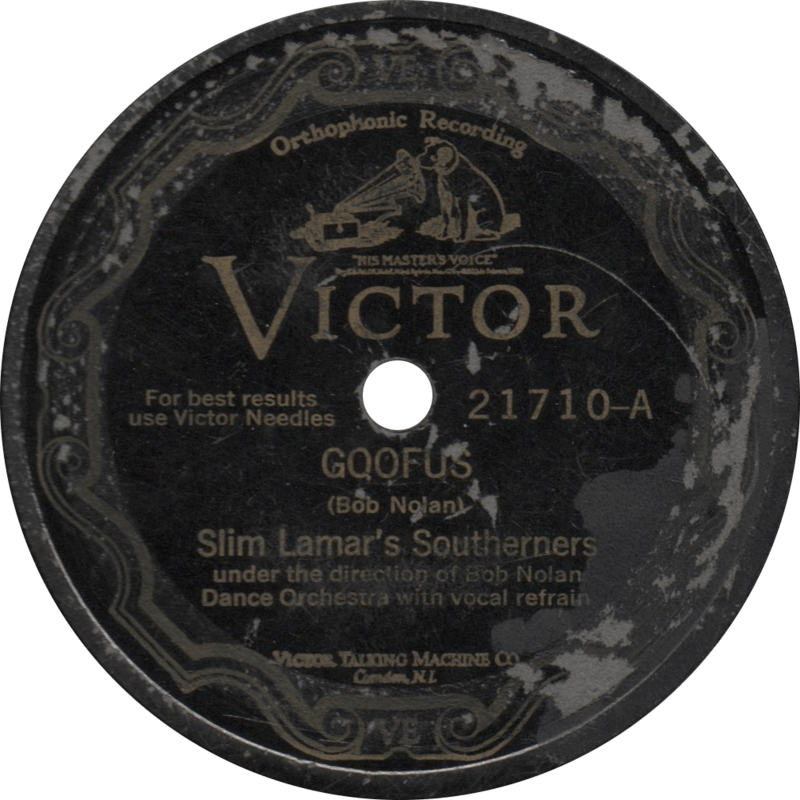 This was the first side recorded by the Memphis Jug Band. 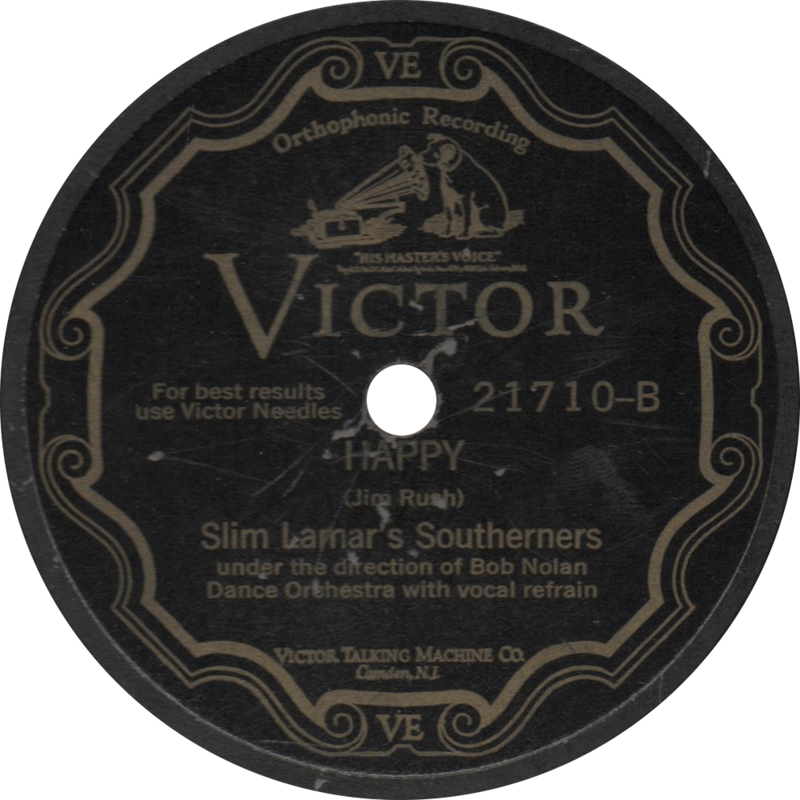 Sun Brimmers, recorded February 24, 1927 by the Memphis Jug Band. I’m goin’ to town honey, what you want me to bring you back? Bring a pint o’ booze and a John B. Stetson hat. Bring it to me, honey!